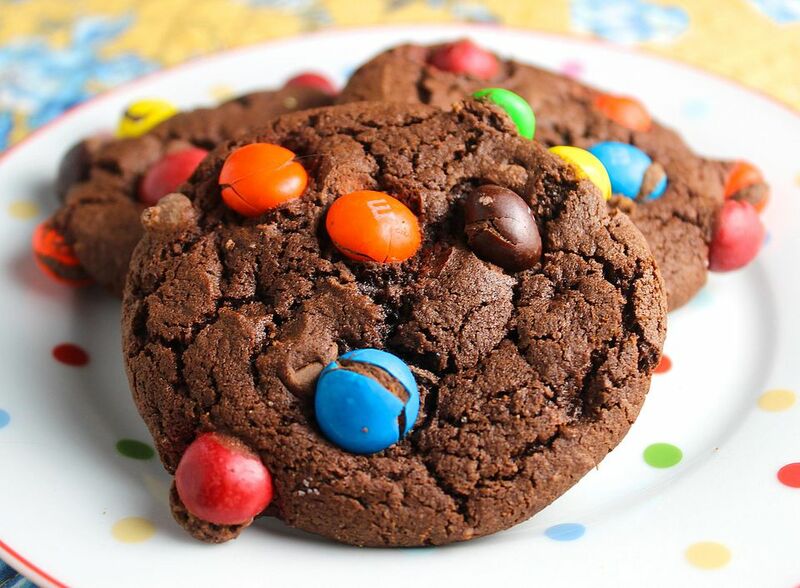 M&M Brownie Cookies are a combination of two favorites: brownies and M&M Cookies. They're easy to make and so delicious. These cookies are like chocolate chip cookies, but the batter is chocolate, not plain. Because there is more chocolate in these cookies, they have more flavor than ordinary M&M cookies. The texture is fudgier, with crisp edges and a chewy center. You can use plain or peanut M&M candies in this cookie, depending on which ones are your favorite. Think about using other candies too; those peanut butter chocolate coated candies would be great. These cookies are perfect for lunch boxes and the cookie jar. You can also freeze the dough and bake the cookies later. To do that, form the dough into balls and put them on a waxed or parchment paper-coated cookie sheet. Freeze until firm, then put the dough balls into a hard sided freezer container. Label the container with the name of the recipe, the date you made the dough, and the baking instructions. Then just bake the cookies from frozen, adding about 5 minutes to the baking time. These cookies are wonderful with a glass of cold milk for an after school snack. In a large bowl, beat the butter with the brown sugar and granulated sugar until light and fluffy. Stir in the melted chocolate and beat in the cocoa. Then beat in the eggs and vanilla until the mixture is fluffy. You can do this by hand or with a hand or stand mixer. Add the flour, baking soda and salt to the bowl and mix just until a dough forms. Don't over beat this mixture or the cookies will be tough. Stir in the candies. Cover and chill the dough for 4 to 6 hours in the fridge. When you are ready to bake the cookies, preheat the oven to 350°F. Form the dough into round balls by tablespoons, about 1" in diameter, and place them onto ungreased cookie sheets. You can press more candies into the tops of the dough balls if you'd like. Bake the cookies for 8 to 11 minutes or until the cookies are set but still slightly soft. Let them cool on the cookie sheet for 2 minutes, then remove the cookies carefully, using a spatula, to a wire rack to cool completely.